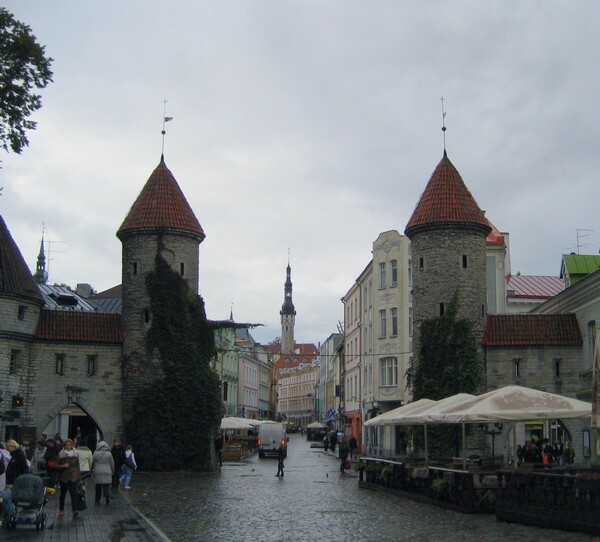 Viru Gate is one of the entrances to the Old city of Tallinn. This place is located on the eastern edge of the Old City, close to the “Sokos Hotel Viru” hotel and shopping center “Viru”. It is easy to get to the Town Hall Square and then to the rest of the attractions of the city from this place along Viru street. Near the Viru Gate are located McDonald and Hesburger cafes, where it is relatively inexpensive to eat. Only two towers of Viru gate has saved to our days. In the Middle Ages there were also the main towers and drawbridge. They have not survived to our day. There are two towers played an additional role in protecting the entrance to the city on the photo. Photo of Viru Gate in Old Town in Tallinn, Estonia The photo was taken during a trip to Estonia in 2012. See attractions and interesting places location on the Tallinn map.